Go Go is the youngest in a family of four and has three older brothers. It’s a outdoorsy sort of life they live and that’s just fine by her. She rough-and-tumbles with them all weekend long and inherits their hand-me-down clothes. But not her shoes – these she is allowed to choose new. And what shoes she chooses – sparkly silver and perfect for wearing everywhere. When misadventure sees one shoe go sailing off down a river Go Go is sad and she continues to wear the remaining shoe to school. This further cements her status as being a bit odd. When her teacher gives Go Go the task of showing a new girl around, she could never imagine what happens next. This is a delightful story for 4-7 year old readers, particularly those who don’t understand why they should be defined by the often unwritten rules of others. 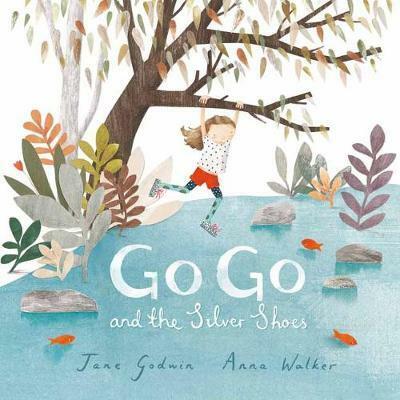 Told with eloquent simplicity and illustrated using collage, gentle watercolour and pencil, ‘Go Go and the Silver Shoes’ is a charming story of friendship and belonging from an accomplished creative team.